A really relaxing, straight forward day on a mix of very quiet 4wd tracks and continuing on the Alps to Ocean (A2O) cycleway. I shared a hostel room with a Japanese guy last night and had a restless sleep. The bunk bed was a cheap metal thing, moving and creaking loudly anytime either one of us rolled over. He was a loud snorer as well and kept me awake for a good chunk of the night. My alarm went off at the usual time of 6:30am but I hit the button, rolled over and had a sleep in. I knew the walking would be a piece of cake today and there was no rush. Finally up and moving, I had a nice hot shower, packed my gear and headed across the road to the bakery to pick up some fresh salad rolls for lunch. Next stop was across to the Hydro Cafe for a cooked breakfast and large double shot latte. 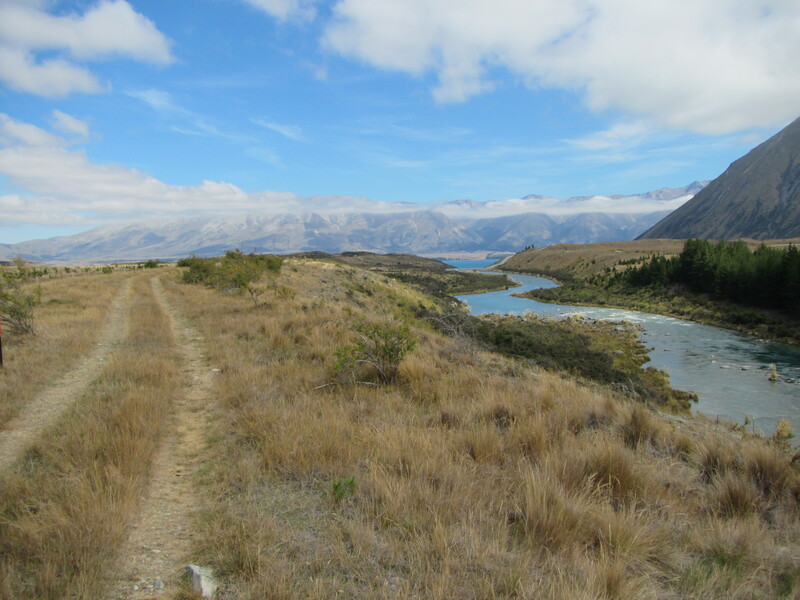 I was on the road around 8:30am, picking up a walking/bike path adjacent to the highway and followed this for a few kilometres to a bridge over the Ohau River and the Ruataniwha Dam wall. A Salmon farm operates in the Ruataniwha Lake with a line of large floating cages and nets strung together in a lot line. I couldn’t see the fish but could hear them breaking the surface and churning the water. Quite a few fisherman lined the banks hoping to snag the odd fish that have made an escape from the pens. The trail lead headed up past the salmon pens, along on a terrace above the lakes stoney banks. It was easy walking along here. A mix of trail and the odd section of a 4wd track before the trail continued predominately on the 4wd track. It was very, very quiet. No traffic at all. This was great. I floated along, listening to my ipod which always seems to make the miles tick by. I’m reliving my childhood and halfway through Mark Twain’s the Adventures of Huckleberry Fin. 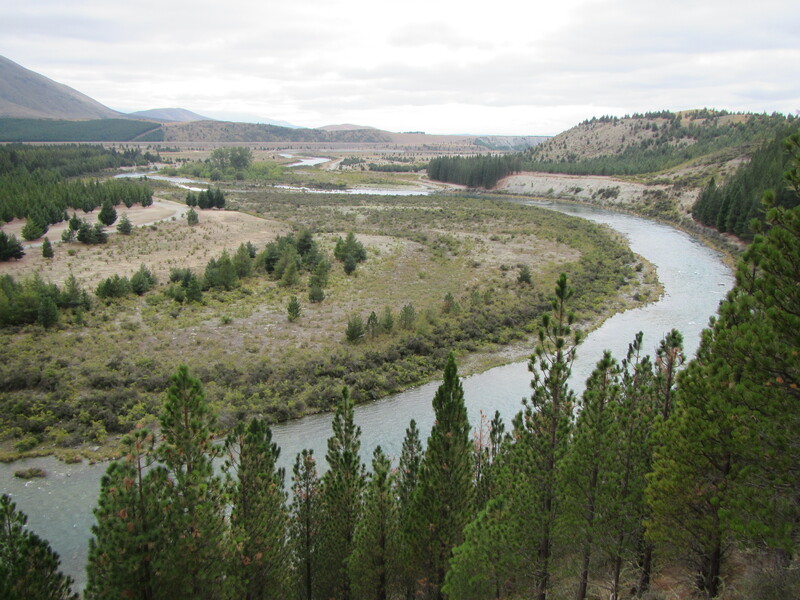 I made it around the southern edge of Lake Ruatainwha and continue following the Ohau River up stream which connects Lake Ohau to Lake Ruataiwha as part of a large hydro electric scheme in these parts. Getting to the weir at Lake Ohau itself I stopped for lunch before I started down the A2O route. I found the tiniest piece of shade under a bush and made myself comfortable for a long lunch. Now on the cycleway proper quite a few cyclists started to come past, a mix of rail trail type riders out on guided tours and the authentic cycling tourist types, bike loaded with panniers. Also a large pack of 10 riders in matching jerseys raising money for a cancer charity on a long ride around the country. They were all great. Many of the touring cyclists took a real interest in my Te Araroa journey and I had a stack of conversations along the way. It was great to be able to talk shop with them as well, looking at their bike set ups and talking gear. A couple were on fold up bikes with panniers which I took a real interest in. They’ve ridden about 2000 kilometres but were struggling on the gravelled cycleway with small wheels. 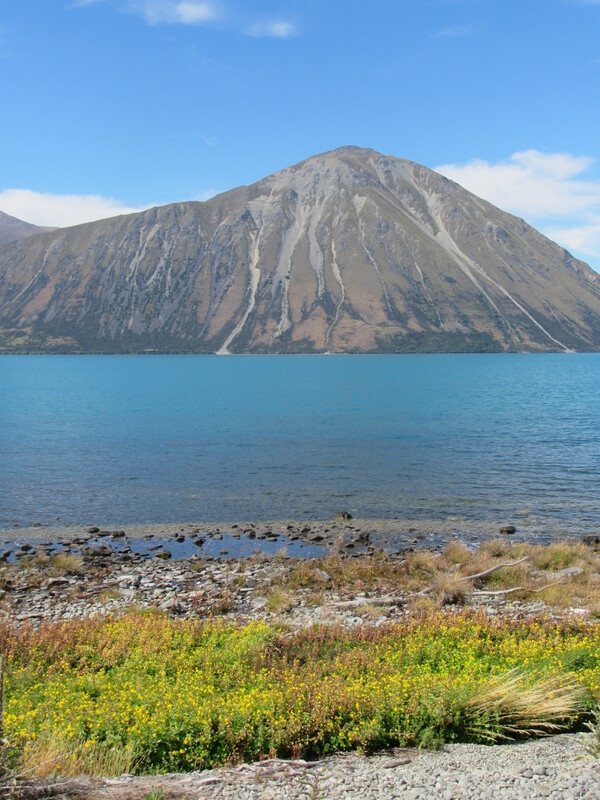 The walking was a cruise as I continued on the A2O around the edge of Lake Ohau. Approaching the end of the cycleway and getting out towards a short road section if was mid afternoon with a blazing sun. It was hot out and exposed. I had plenty of time and cut across to the lake, dumping my pack, jumping in for a refreshing swim. I imagined it would be freezing given the steep peaks at the back of the lake, many with snow deposits still clinging to their sides, but it wasn’t too bad. I ran into the water in any case so I wouldn’t chicken out when my feet first hit the water. Out above head height it was cold. Coser into shore it was perfect. I wallowed away in the shallows for a good 20 minutes, absolutely refreshed, and lay on the warm rocks to air dry. After my swim it was an easy 1.5km of road walking to a nice campsite at Lake Middleton. Lots of families and cyclists camped down by the lakes edge but not for me. I’ve always found that sleeping in the open without tree cover or near open water that I get a stack of condensation in the morning but not so under the trees. I found the perfect site nestles in amongst pines. A lovely day. Son, are you dictating, using some sort of speech recognition program to record all this, how are you finding time to write such descriptive passages? Would love to know. As you said passed the 2500 marker, so not long to go now. Podiatry appointment on the way back home. Love from me. With close to four months of no TV, no distractions, its easy to find 15 minutes a day to write and recall the day. Definitely a physio appointment at the end and a massage. you call 8.30 a late start! loving the read, keep it up.